It was completely against my principles, not to mention against my will, which I considered writing during the ordeal. “I should have listened to my father’s advice. I should have listened to my father.” Of course, I HAD listened to Dad’s advice. This was the first time in all my 43 years I’d gone shopping on Black Friday. Even worse- this was Thursday night. And it still gets worse- the store was Kohl’s, a store I dislike because of their overpriced clothes and slow cashiers. But I have to be fair- they do sell good t-shirts, if you ignore the fact that while the graphics are cool, the material is thinner than your average piece of lint. We ended up in Kohl’s only because I refused to wait in line at Best Buy. The line stretched and snaked around the store and stupid as I felt to be shopping on Black Friday Thursday, no way was I going to lower myself to the level of the motley group standing in the cold for a phone that would be obsolete before I got it out of the box. I can’t tell you what exactly we went to Kohl’s for- pots? Pillows? The heck of it?- but we ended up with two entirely separate and distinct blenders (which seem to do the same jobs except one blends directly in a cup from the bottom and the other blends directly in a cup from the top) and a Pyrex cooking set. I also picked up a headache and some aggravation, but that was free, no standing in line, which was good, since it was the standing in line that gave me much of the aggravation. 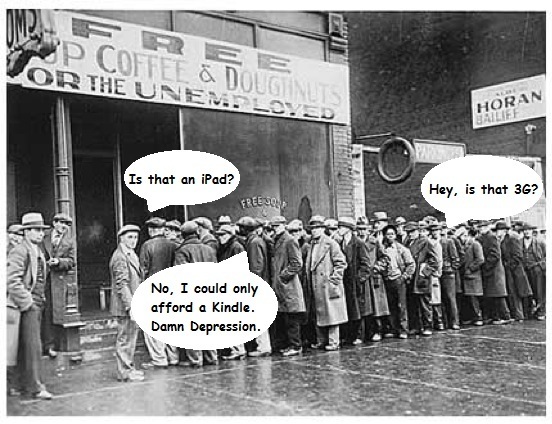 The Modern Depression. Yes, I’ve used this joke before. The people in front of us had about 108 ugly coats in their wagon, and each one was examined in minute detail, which included holding them up to the light and various family members trying to see the light through the sleeves. I’m not sure what the point of it was, unless it was to see if the sleeves could double as telescope cozies, but that operation was the subject of a great deal of non-English debate. I bring up the fact that they spoke no English not to be biased, but to make you understand why, when the store employees would occasionally ask them to move up, the line was now 20 feet ahead of them, they looked at the employee with complete non-understanding until the employee pointed and waved. And this happened at least four times. We left, and none of us could find my car in the parking lot. It took almost ten minutes to find it, and when we did, everyone agreed that it was not where we had left it. I, however, know for a fact that it was, because getting in I soaked my foot steeping in the same deep puddle I stepped in getting out. Next year I stay home and, in honor of my Dad, fall asleep on the couch watching TV.